The Ahmed Kathrada Foundation is deeply saddened to announce the passing on of ANC veteran Ahmed Kathrada (87) this morning, at the Donald Gordon Hospital in Johannesburg. Kathrada passed away peacefully after a short period of illness, following surgery to the brain. Neeshan Balton, Executive Director of the Ahmed Kathrada Foundation, confirmed that the anti-apartheid struggle veteran “breathed his last today”. “This is great loss to the ANC, the broader liberation movement and South Africa as a whole. Internationally, he was staunch in his support for the Palestinian struggle. ‘Kathy’ was an inspiration to millions in different parts of the world,” said Balton. Kathrada Foundation Chairperson, Derek Hanekom, was overcome with emotion saying he has lost a “revolutionary mentor and dear friend”. “Comrade Kathy was a gentle, humane and humble soul. He was a determined revolutionary who gave his entire life to the liberation struggle in our country,” he added. 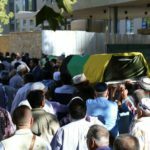 Kathrada will be buried according to Muslim religious rights, details of which will be made publicly available in due course. Fellow Robben Island prisoner, Laloo ‘Isu’ Chiba (86) said that his comrade’s death has left a deep vacuum in his life. “I have worked with Kathy for over sixty years. He has been my strength in prison, my guide in political life and my pillar of strength in the most difficult moments of my life. Now he is gone,” said a visibly shaken Chiba. Kathrada has had an illustrious political career having served between 1994 and 1999 as the parliamentary counsellor to late President Nelson Mandela. He was born on 21 August 1929 in rural Schweizer-Reneke and was introduced to politics as a young boy when he joined a non-racial youth club run by the Young Communist League. At the tender age of 17, Kathrada participated in the 1946 Passive Resistance Campaign led by the South African Indian Congress. He was part of 2000 resisters who were arrested and imprisoned for defying a law that discriminated against Indian South Africans. Kathrada, under the tutelage of Transvaal Indian Congress leader, Dr Yusuf Dadoo, later befriended emerging ANC leaders such as Walter Sisulu, Nelson Mandela and Oliver Tambo. In 1951, Kathrada visited East Berlin to attend the youth festival jointly organised by the World Federation of Democratic Youth (WFDY), and the International Union of Students (IUS). While there he visited Poland, where the Auschwitz concentration camp left an indelible impression on him. Back home in 1952, Kathrada was in a group of 20, including Mandela and Sisulu, who were sentenced to nine months in prison with hard labour – suspended for two years – for organising the Defiance Campaign against six unjust, apartheid laws. The campaign was jointly organised by the ANC and SA Indian Congress. In 1954, Kathrada was placed under restrictions by apartheid security police and was arrested several times for breaking his banning orders. In 1956, he was among the 156 Congress activists and leaders charged for High Treason. The trial continued for four years after which all the accused were acquitted. Kathrada, Mandela and Sisulu were among the last 30 to be acquitted. While they were on trial in 1960, the ANC and PAC were banned. In 1962, Kathrada was placed under “house arrest”. The following year Kathrada broke his banning orders and went underground to continue his political and military work in the ANC’s armed wing, Umkhonto we Sizwe (MK). In July 1963, the police swooped on Liliesleaf Farm in Rivonia, a Johannesburg suburb where Kathrada and other banned persons had been meeting secretly. This led to the famous Rivonia Trial in which eight accused were sentenced to life imprisonment with hard labour on Robben Island. 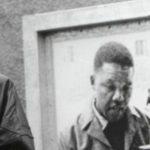 His fellow prisoners included ANC leaders such as Mandela, Sisulu, Govan Mbeki, Raymond Mhlaba, Denis Goldberg, Elias Motsoaledi and Andrew Mlangeni. Kathrada spent 26 years and 3 months in prison, 18 of which were on Robben Island. In 1982, Mandela, Sisulu, Kathrada, Mhlaba and Mlangeni were transferred to Pollsmoor Prison in Cape Town. While in prison he obtained four university degrees, namely, BA (in History and Criminology), B Bibliography (in African Politics and Library Science), BA Honours (History) and BA Honours (African Politics). Soon after his release on 15 October 1989, the ANC was unbanned. At its first legal conference in South Africa, Kathrada was elected onto its National Executive Committee. Until 1994, he headed the ANC’s Public Relations Department. At its Conference in 1997, Kathrada declined nomination to the National Executive Committee. In 1992, Kathrada undertook the Islamic Haj pilgrimage to Mecca in Saudi Arabia. In 1994, Kathrada was elected to Parliament and served as President Mandela’s Parliamentary Counsellor. He was chairperson of the Robben Island Museum Council from 1997 until his term expired in 2006. In 2008, the Ahmed Kathrada Foundation was launched with the aim of deepening non-racialism. Kathrada was an active participant in the Foundation’s work, which includes promoting Constitutional ideals and human rights, youth leadership and development, challenging racism and preserving and promoting liberation history. Kathrada’s activism spanned a total of 75 years. Kathrada is survived by his wife, Barbara Hogan, also an ANC stalwart and veteran. * To arrange sit-down interviews with a representative of the Foundation, contact Zaakirah on the contact details above. For comment/ soundbites, contact Neeshan Balton, the Foundation’s Executive Director, on 082 373 1143.